The IAF is a global association that operates in seven regions. Within each region, there may be one or more IAF chapters. In addition, IAF Special Interest Groups focus on specific topics of interest for facilitators across regions. Each region has a Regional Director who provides leadership and coordinates activities. You can learn more about each region below. IAF Chapters are simply national or local groups of IAF members who meet and collaborate to pursue the Association's mission at a more local level. Chapters also respond to the expressed desire of our members for more frequent and local opportunities for professional and personal development. 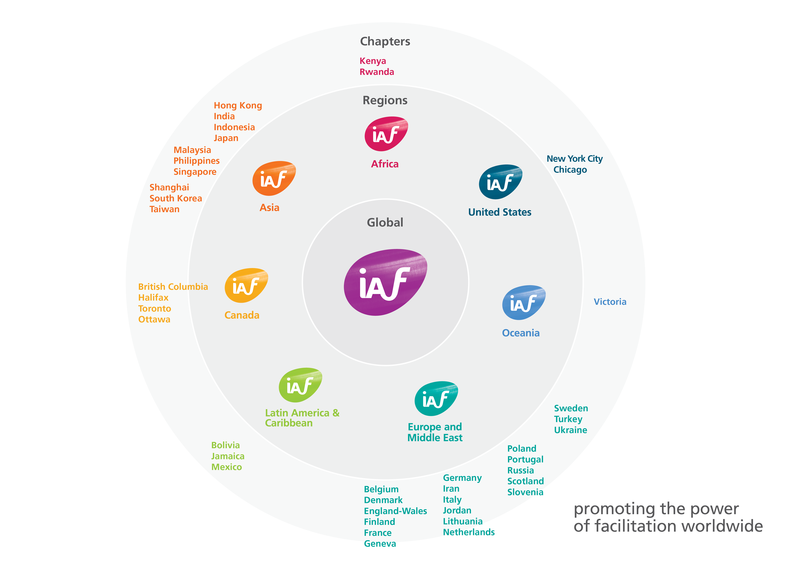 IAF chapters are created by a request to the IAF Board following a recommendation by the Regional Director and the Director for Membership and Chapters. The steps to creating an IAF Chapter are straightforward and designed to provide an understanding of the IAF's governance and to ensure proper accountability. In the event that this may not be the case, the IAF Board retains the right to dissolve a chapter. For more information about the creation of a Chapter, please contact the Director of Membership and Chapters. Special Interest Groups (SIGs) enable like-minded facilitators to network, create and share knowledge around a specific facilitation-related interest area. IAF hosts these communities to foster the creation of strong global networks. Special Interest Groups add membership value as members can develop and grow in their specific area of interest. The IAF has a clearly defined vision and mission, as well as a series of values, which guide our work and play worldwide.